Traveling with kids? 5 tips and tricks for not only surviving, but enjoying travel with children. 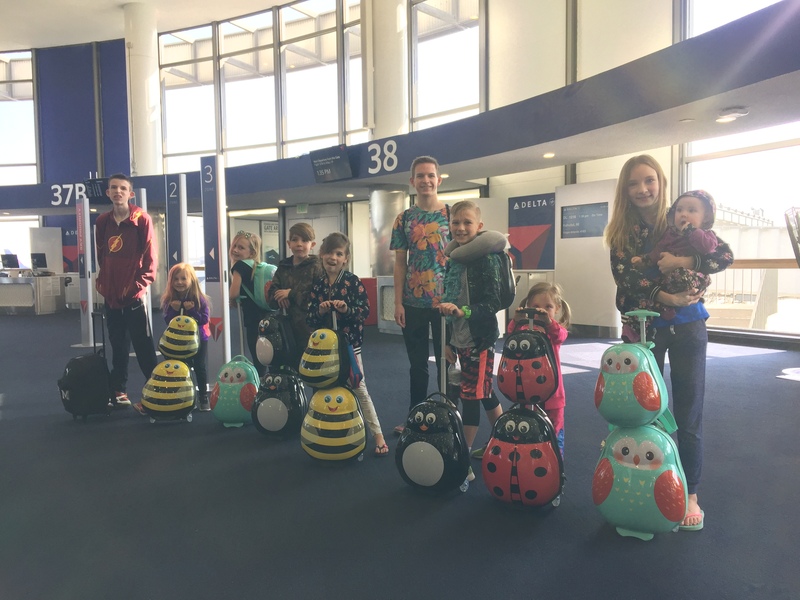 Do you have an upcoming trip with young children? Are you dreading it? Or looking forward to the memories that will be made? I fully believe that family vacations are one of the most important ways to build family unity, strengthen bonds, and enjoy quality time together. However, traveling with young ones can be not only intimidating but often frustrating as well. I have had amazing experiences with young children in tow and times that made me want to sit down and cry and not ever go anywhere again (fortunately these thoughts were short-lived!). One time when I was traveling from my home in Phoenix, Arizona, to Salt Lake City, Utah, I decided to use a discount service to bid for a flight. I ended up saving $50 a ticket but it also added on a 2-hour layover each way in Denver. On this particular trip I was flying with a 4 year old, 2 year old, and an infant all by myself! Any sane person would realize this was not a good plan! After arriving in Denver I nervously followed my littles off the plane. Anxious to stretch their legs my 4 year old ran one way, my 2 year old another and I was soon chasing after the both of them while juggling the baby and all of our traveling supplies. Yikes! Kind strangers could see my plight and tried to help stop my little runaways but unfortunately not before my oldest pulled the fire alarm! Not the best trip ever! Recognize that when traveling with children everything takes more time. When flying give yourself more time to get to the airport and get checked in. On a road trip remember children will need to make more frequent stops to stretch their legs, eat, or go to the bathroom. Once you are to your destination don’t forget to plan in nap/rest times throughout the day. Often we try to pack in as much as possible throughout our stay making sure we don’t miss anything, but this isn’t the best idea with little children. Potentially skipping one activity to take a break can often make the rest of the day more enjoyable. Going into the trip with this in mind can lessen frustrations along the way. Prepare a trip bag with a few new toys and books. I remember when one particular trip we went on my Aunt made us a little trip bag. She had wrapped up presents for us to open each hour along the drive. As kids, we were so excited but truthfully my parents loved it as well as we played happily in the backseat. Keep in mind the best toys are not the most expensive—cheap dollar toys are often best because then you don’t need to worry about losing them along the way. Packaging items up in a fun way by wrapping them and then writing times to open them can add to the fun. You might try taking your children to the dollar store with a set amount of money, say $5, to pick out a few items can have them looking forward to the trip. Libraries can also be a great resource for free things to bring. But also bring something from home. Does your child have a favorite stuffed animal or blanket that they can’t sleep without? Often trips can be a bit overwhelming for a young child so having something they are familiar with can help provide comfort. Just make sure not to lose it! If there is a certain brand of pacifier that your child just loves—bring several! I remember a sleepless night walking around the grounds of where we were staying looking for that all-important binky with a screaming baby in the background! Be prepared! Not only the Boy Scout motto, this can save a day from becoming a disaster. Don’t forget to bring a bag filled with things you might need, I recommend a comfortable backpack. Things like extra diapers and wipes are nice to have on hand. Wipes are great not only for those with small children but also to wipe off dirty fingers, airplane trays, or to clean up spills. My youngest is now 12 and I still love to keep them in my car. Snacks, medicine, art supplies/paper and pen, hand sanitizer, headphones, travel games, sunglasses are all things I like to carry in my bag. Remember the wonder of traveling as a child. Watch as your children experience things for the first time. Flying is wondrous for a child! Remember the first time you took off on an airplane—the feeling as you are suddenly roaring along the runway and then thrust into the sky! Or the feel of a sandy beach on your toes as you take your first dip into the ocean. Seeing these through the eyes of your child can help you experience an even greater joy! Taking just a few minutes to prepare before your trip can help you not only survive, but help gear you up to make lasting fond memories as well!